Phillip Hughes death: How do you cope with the loss of a team-mate? Under cloudless Australian skies, the Sydney Cricket Ground can feel almost cocooned from the cares of the world. Like all sports grounds, it was built to stage triumphs, not tragedies. But a year ago, real life intruded in the most brutal fashion. South Australia batsman Phillip Hughes, 25, was struck on the neck during a Sheffield Shield match, attempting a hook shot to a head-high bouncer. The ball severed an artery, and Hughes died three days later. The ball that struck him not only felled Hughes; it left an entire cricket community on its knees. For the team-mates who shared a changing room, his death was particularly savage. While the media gaze moved on, they could not simply switch off the pain of losing a loved colleague, returning to the treadmill of professional sport. "We can be too quick to forget sportspeople are people," says Brian Hemmings, a sports psychologist who has worked with golfers, cricketers and boxers and is also a trained grief counsellor. "Sport quickly moves on and we start scrutinising people's performances again, but for someone in the grief process, 10 months or a year can be such a short space of time. "Grief remains one of the most untalked-about, least understood things, but it can have a profound effect on what they're doing on the field." So what is it like to lose a team-mate? In a world ruled by marginal gains, how do you deal with such an overwhelming loss? 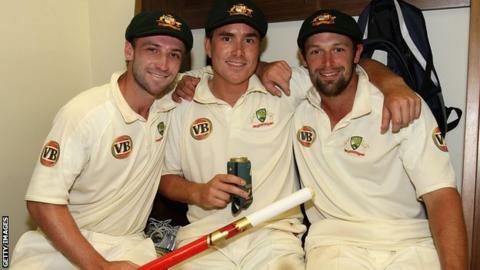 BBC Sport spoke to three sportspeople, including Hughes's friend and former team-mate Nick Compton, about the impact it had on them. England batsman Compton first met Hughes when he played grade cricket with him for Sydney club Western Suburbs. The two later played together at English county side Middlesex, a period in which they also shared a house. "Phil was already pretty much a superstar when I met him," recalls Compton of a player who had enjoyed a prolific debut season for New South Wales and was on the verge of his first Test call-up. Compton was there to see him hit his maiden hundred in his second Test, against South Africa in 2009. "He was a very friendly, funny guy, with an infectious personality. When I might have overcomplicated the game and thought too deeply about it, he was just cap backwards, earring, 'have a bit of fun mate, express yourself and just go for it'. It was refreshing for me." Hughes was not just a mate for the good times: he was also a source of support at the bleakest moment of Compton's career in 2013, when he unexpectedly lost his place in the England side after nine Tests. "I just felt absolutely broken, for quite a while actually," says Compton of his friend's death. "To lose someone who I spoke to quite a lot through my England experiences, who always made you feel better about yourself, in that sort of tragic way, having not had a chance to further our friendship, was devastating. "I went back to South Africa over Christmas having been at his funeral and I felt incredibly flat. I found it very hard to get out of bed in the morning, to motivate myself, to pick up the pieces again." Compton had three months to get his head right for the start of the new county season. He was desperate to hit the ground running with Middlesex and try to win back his England place - a goal Hughes had wanted him to achieve. But when he tried to throw himself into training, he realised something was wrong. "I hit a wall," he says. "One of my attributes is that when I do something, I like to do it with a certain intensity, and I just felt like that period had gone. "If I tried to go for a run, 5km felt like 20km. I felt empty. Cricket felt totally insignificant." Hemmings says such a reaction is not uncommon. "Part of the grief response can be one of utter confusion and questioning what you're doing on a daily basis," he says. "Some of the things that you've done very diligently as a sportsperson, there can be a sense of: 'What's the point of that?'" Mijat Maric is a defender for Belgian football club Lokeren. In April, his team-mate Gregory Mertens suffered a cardiac arrest while playing a reserve game. He died three days later, aged 24. Maric, 31, remembers Mertens as "a friend, not just a team-mate". "I play centre-back and that was his position too," he explains. "I play on the right and he played on the left. It was more than just a normal relationship between team-mates. "He was younger than me and I saw it as my job to help him. He was a nice boy, very humble, someone you could count on in the bad moments." Like Compton, Maric says the death of his friend and team-mate was the trigger for a profound crisis of motivation. "Football is our life and it's something you pour your heart into trying to do to the best of your ability," he says. "But when you lose someone close to you, it suddenly seems very small by comparison. In an instant, it takes on a different meaning. "We just wanted to go home to our families and not think about football." But Lokeren's players were not given that choice. Instead, they had to play a league game against Westerlo on 1 May - the day after Mertens' death. "It was horrible," says Maric. "It was a match that should have been avoided. But football is often about money and business and the players don't count for much. "I was on the pitch, still in a state of shock. I couldn't concentrate. I had nothing left. I couldn't get off the pitch quick enough - I wanted to get straight home to my wife and my little child." Swiss-born Maric is still haunted by one detail of that day. "You go back into the changing room and see the space where your team-mate used to sit next to you. You have the memory of him but he is not there anymore. That is something you cannot express in words." Canadian freestyle-skier Roz Groenewoud was inspired to get into the sport by Sarah Burke, who later became her team-mate and training partner. Burke was killed in a training accident in 2012. For Groenewoud, Burke's death robbed her not just of a team-mate, but also a mentor, an idol, and a "big sister". "There was definitely that aspect to our relationship," she says. "Sarah was seven years older than me, so I'd get those occasional disappointed looks that a big sister would give a younger sister. "It was just me and her on the half-pipe team for quite a while - and so I got to spend a lot of time being around her and seeing how she operated in the world, and getting her advice on a lot of different aspects of my life." After the initial "fog" of Burke's death, Groenewoud coped well, even winning a gold medal at the 2012 X Games barely a week after the bereavement. But what she had not prepared for was the barrage of questions away from the half-pipe. "I was 22 and I not only had to go through the experience of losing someone, but I had to talk about it so much more than people traditionally have to talk about loss," she says. "It was a very different way to process grief, because I had to be able to eloquently package my feelings for the media. In the months following, I got to the point that I could talk about Sarah's death without even turning on my brain. "I developed what I felt like were thoughtful answers, and I was able to turn off my feelings and regurgitate those answers. It was a draining thing to go through." To outside observers, Groenewoud seemed to have conquered her grief, and was strongly fancied to add Olympic gold to her X Games title in 2014. But when she arrived in Sochi, the defence mechanisms she had relied on failed her. "I remember at the Olympics, on my first day I'd just finished a great day of training," she recalls. "Our media attache said 'There's an interview for you' and their first question was about Sarah and I just remember being like a deer caught in the headlights because I hadn't had to talk about it. "The whole Olympics ended up being a lot of coming back to dealing with the grief of losing Sarah. I was on autopilot for a lot of the media appearances. "But it would always surprise me because there would be one question that I hadn't really thought about before, and it would force me out of autopilot, and bring out the tears that I had been able to hold back." Overwhelmed, Groenewoud finished seventh in her final. Brian Hemmings says there should be a greater understanding of how hard it is for athletes to cope with a bereavement. "Grief confounds everything you've tried to do as a sportsperson, which is about marginal gains, about being dedicated to training and applying your whole life to something," he says. "It can make you question everything you do. There is no 'letting go' or 'getting over it'. All you can do is adjust." Four years on, Groenewoud - who wears a sticker of the name Sarah on her helmet in each competition - is still adjusting. "Within our team, nothing will ever be quite the same," she says. "But there's a new normal now. "Sarah's death has made me want to ski harder and push myself more. I'm a lot less afraid than I was before, in an effort to make each moment worth it. If I might die skiing, then I also want to go out on top like she did." Maric says grief has changed his outlook on sport too. "Sometimes, I try to persuade myself that Gregory has just joined another club, but I know that is not the case," he says. "In football, there is little sentiment. But when something like this happens, you think of the little moments, the little details of the good times you share with people. "You don't know what is going to happen tomorrow, or in an hour. And so it's taught me to make the most of that." As for Compton, he got his motivation back. "There was a time when I thought I'd had enough," he says. "But Phil wouldn't be happy with me if I decided not to play. He'd want to see me get out there and achieve what we both believed I could do. "I decided I was going to give it a good crack and almost dedicate it to Phil." Many had written off Compton's hopes of an England recall. But after a fine end to the County Championship season, including a sparkling 149 against Yorkshire, last week the 32-year-old was recalled to the Test squad for the forthcoming tour of South Africa. "It's very sad, but I feel very proud of knowing Phil," says Compton. "Sharing his first hundred in Durban, having a late-night coffee with him on the beachfront, his cheeky grin, his eyes glistening with that untouchable fearlessness. He touched me in ways I don't think he realised." It was cricket that forged their friendship, and cricket that ended it too soon. And yet through cricket it lives on, in Compton's memories of long afternoon sessions. "When you're out there in the middle, only you and your partner know the depths and the places you go," he says. "You can't really replicate that in other parts of life, those moments when time stands still, when it's just you and your partner and you're in a really tough phase of the game. "That present moment, being there with your team-mate, they're special moments. I shared those moments with Phil. He was a special mate."